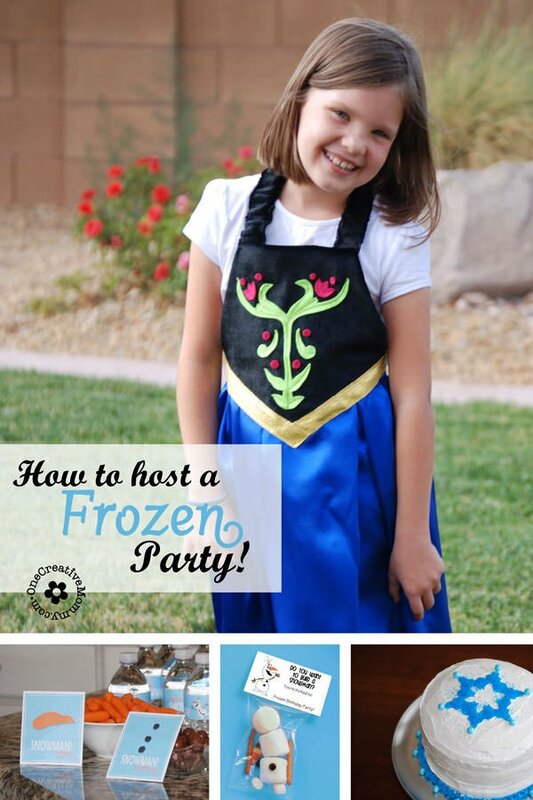 If you haven’t seen my most recent posts, I’ve been sharing ideas from my daughter’s Spy Birthday Party. 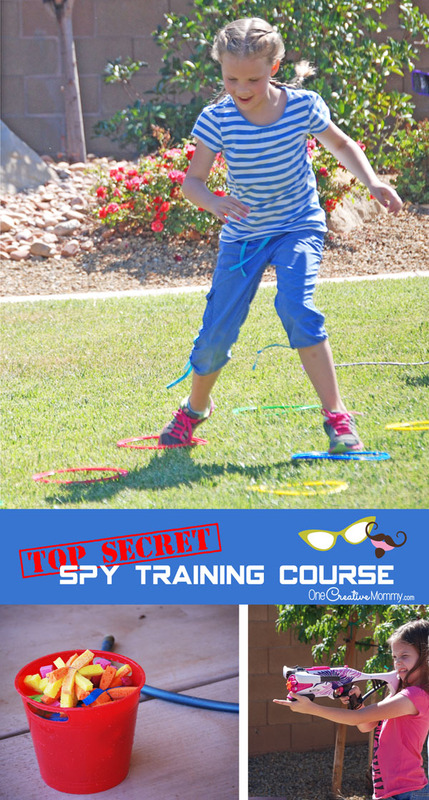 Once we got the guests to the party, we had to train our potential secret agents. 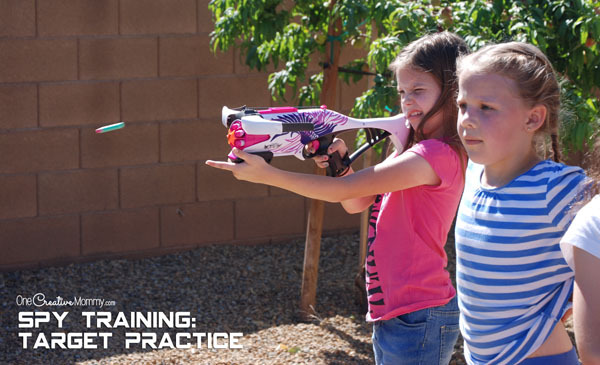 We put them through several spy training activities. 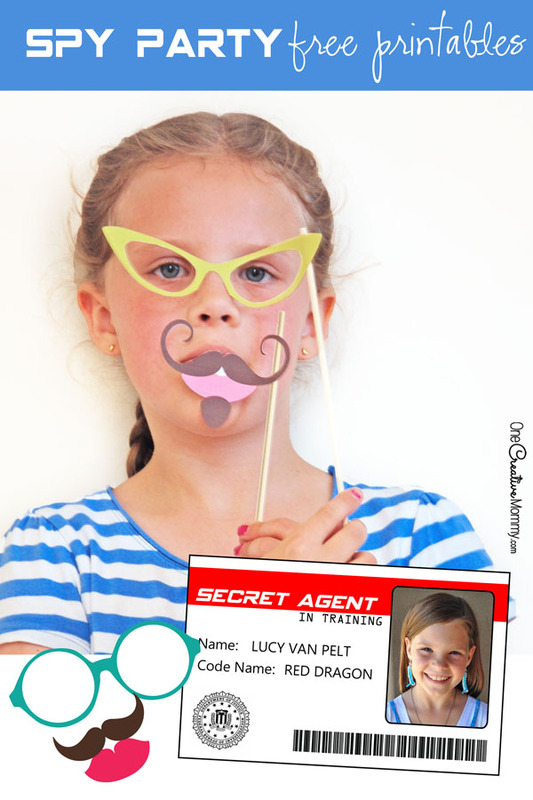 Once the agents picked their spy names, we added the name to their Spy Badges. 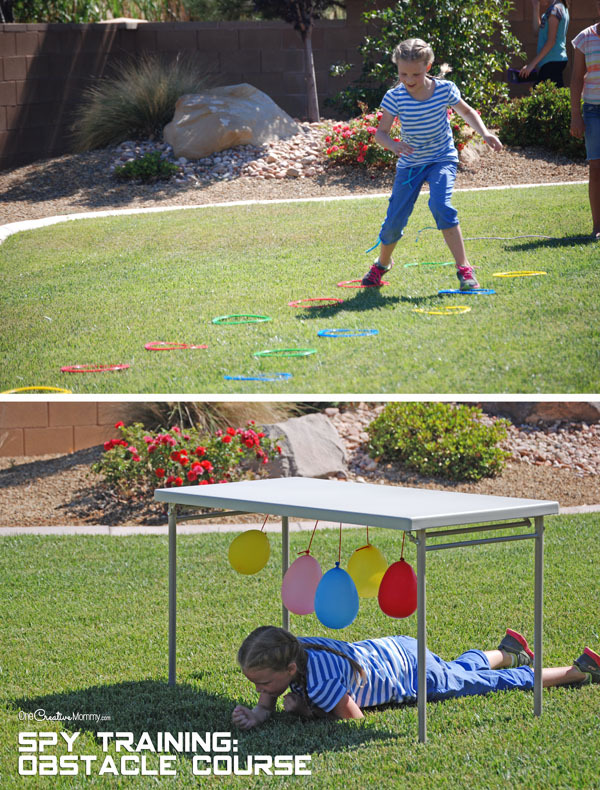 For the obstacle course, we used the rings from Twister Hopscotch instead of tires, lined up some cones for zigzag patterns, hung balloons under a table for crawling under, and finished with a jump rope tightrope. It was a lot of fun! Once the kids were good and hot, we tested the agents’ agility and reflexes with a game of wet sponge dodge ball. 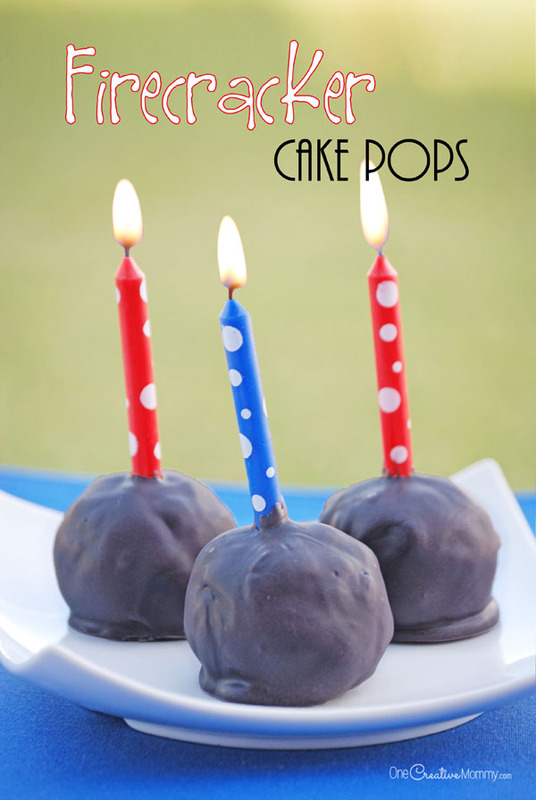 You can use a bucket of water and regular sponges or these fancy sponges we made for our family reunion. 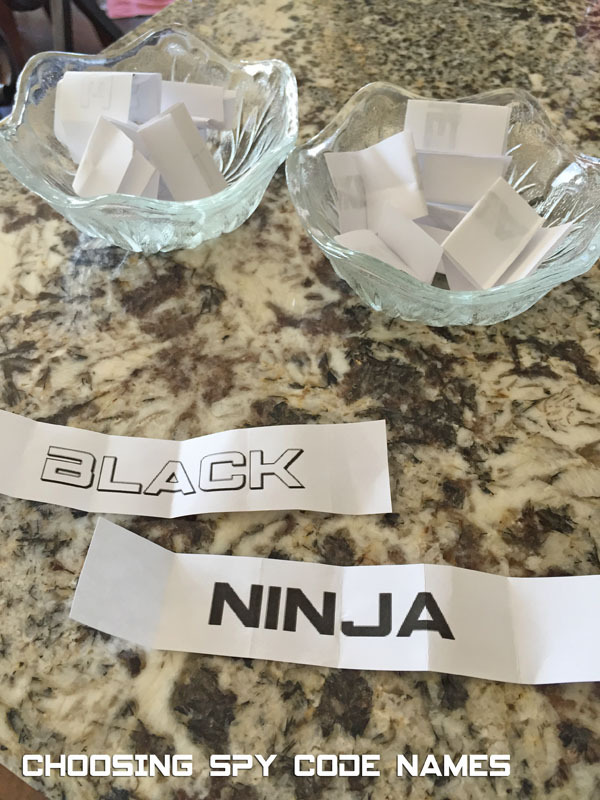 Finally, the teams headed inside for our last two training events: Spy Disguises (get the printable photo booth props here) and a string/laser maze. The kids loved the maze so much that they wanted to do it over and over! All you need is red yarn and painters tape. So easy! Thanks for stopping by today. You might like these other ideas, too. The images below are linked to posts. Click on the image to visit the post. Wow, would you host a spy party for me too? This looks like a blast! Sure, Marilyn! Come on over! Oh my goodness! 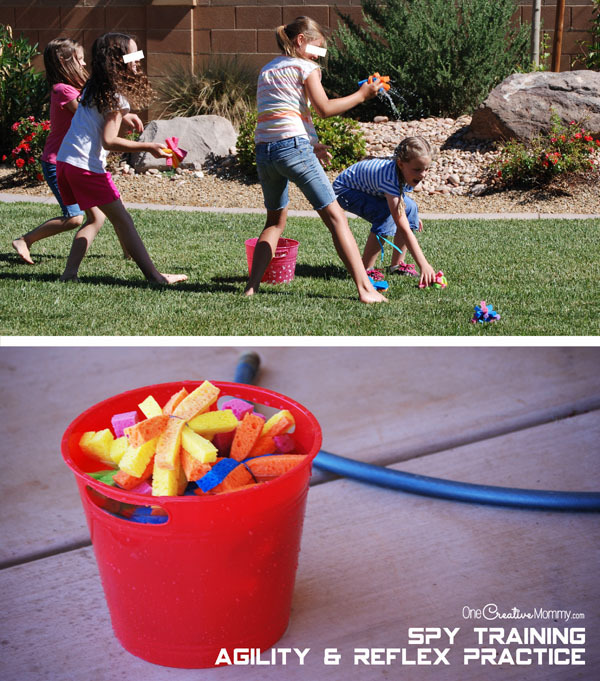 My kids would love to attend or have a spy party! You have some really terrific ideas. I love choosing their code names (would never have thought of that!) 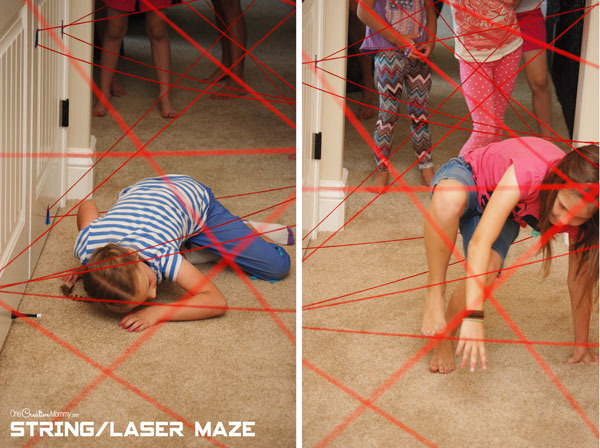 and the lazer maze. This would be fun for older kids too who are into the Alex Rider or Gallagher Girls series of books. So much fun! That’s why I love Pinterest. Some of these ideas are my own, and some were inspired by bloggers from all over the country. I love how the web lets us share ideas.